Diet plays an important role in managing kidney disease in a cat. Chronic renal failure is progressive and incurable, but it isn’t an immediate death sentence. Some cats can live for years with this condition and still enjoy a good quality of life. You can play a proactive role in helping your kitty to live longer. Every cat is different, and the prognosis for your kitty will partly depend on the extent to which her kidneys are damaged, genetic factors, and effective management through diet and medication. Regular blood and urine tests can help increase her lifespan, because they aid in early detection of related medical conditions, making them more treatable. A diet that puts as little stress as possible on your pet's kidneys can slow the development of chronic renal failure and help to prolong her life. Your kitty's failing kidneys now have difficulty filtering the toxins that are released into her bloodstream when her body breaks down proteins. Phosphate also stresses your kitty's kidneys. 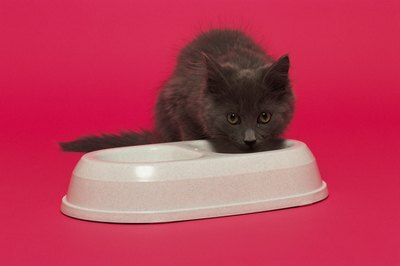 Because of this, your vet will prescribe a low-phosphate, reduced-protein cat food, containing only high-quality protein. Many cats refuse a low-protein diet, so your vet may also prescribe appetite stimulants. Try offering a variety of flavors and heating Fluff's dinner to room temperature to whet her appetite. Some renal kitties must be coaxed to eat; try petting your pal and praising her for eating her dinner. If she still refuses to eat or is losing weight, The Feline Advisory Bureau recommends switching back to a normal diet. Canned food is preferable, because is has a high water content. Boiled eggs, liver and turkey are low in phosphorous and rich in quality protein, according to the Cornell University School of Veterinary Medicine. Try mixing these foods with commercial cat food to accustom Fluff to their taste. Avoid fish, particularly tuna and salmon, because they are high in phosphorous. Vitamin and mineral therapy can help your kitty’s body cope with the strain caused by reduced kidney function. Your vet may prescribe Vitamin B supplements, because large amounts of B vitamins are lost in renal kitties’ urine. Vitamin D supplements may be needed because the kidneys play an important role in the production of this vitamin. Because low potassium levels can accelerate renal failure, your vet may prescribe potassium supplements if a blood test determines her potassium levels are low. Keep water available at all times for your kitty; it flushes out toxins and keeps her hydrated. Filtered or spring water is best, because it contains fewer impurities. Leave bowls of water in every room, and place one by your kitty's favorite sun spot if she likes to hang out in the garden or patio. Intravenous fluid injections may be prescribed to flush out toxins and relieve nausea, vomiting and loss of appetite. Depending on the extent of the kidney damage and level of dehydration, your vet may also show you how to administer fluids at home by injecting them under your kitty's skin. Medication for chronic renal failure and for related medical problems, which include amemia and high blood pressure, helps to extend your kitty’s life and improve her quality of life. Your vet may prescribe drugs to reduce the amount of protein lost through your pet’s urine, and to decrease the level of toxins released into his bloodstream. Cornell University School of Veterinary Medicine: Cat Owner's Guide to Kidney Disease: How is Kidney Disease Diagnosed?